As our children grow older, they begin to have capacity for helping with tasks around the house. This capacity, of course, does not happen just because a child reaches a certain age or gross motor skill level. Helping with tasks must be reached through practice, and just like practicing an instrument, initial practicing of chores around the home is often messy and riddled with mistakes. What are the life skills I am talking about? Anything that needs to be done in the home. Picking up toys, helping with dishes, helping with laundry, making food, gardening, and even parenting are all examples of skills your child will need to learn. This is not always easy. In the early days of teaching these skills, it actually creates a lot more work for you! Someone has to teach the child how to sweep the floor, and that someone will be you. That means time spent to teach. Your child will be neither as proficient or fast as you are at accomplishing the tasks around the home. It seems much easier to just wait for naptime, independent playtime, or something like television time to do these skills. And it is! Let me assure you, however, that at some point, your child will begin to contribute in a positive way to necessary tasks. Your child’s help will move from being less of a burden and more of a help. Your load will be lightened. This is significant in the harmony of the home. As children get older, your life does not become easier. Your time does not become more plentiful. Older children are capable of making larger messes. You likely will have one or more younger children beyond the oldest who need your time and attention. As children get older, they will be involved in activities outside the home. They will also have school needs no matter your method of schooling. Brayden is now seven. There are many things he is able to do to help around the house independently. Two notable things he can do is clean the guest bathroom (most of it–I don’t allow him to clean the toilet yet) and he also can help make rolls for dinner. He can take the risen dough, roll it out, cut it out, shape it, and place it on the pan for cooking. Kaitlyn is five. She also has many things she can do that are very helpful around the house. One of my favorite things she does is help with laundry. She is great at folding clothes and socks. McKenna is three and is still in the stage where most of her “help” is more work than helpful, but I know she will get to the helpful point, as well. Despite the great help that comes when children learn to help around the home, this is not the primary reason we teach our children these skills. The primary reason is because it is our responsibility as parents to teach our children. We are in charge of teaching our children and preparing them for life. Your child is not going to learn how to cook and clean just because it happens in your home any more than your child will learn to read just because you have books in your home. Sure, some kids do all of those things. Most, however, need some instruction. I compare our need to teach our children to the adage that if you give a man a fish, it feeds him for a day. If you teach a man to fish, you feed him for a lifetime. As parents, we are in the business of teaching to fish, not simply handing fish out. We want to teach our children so they can feed themselves for life. How do you go about teaching children these skills? This is definitely a topic that merits many, many posts–not just one. Let me give a brief idea, however, and then link to some helpful posts that go further in depth on the topic. Example: Start by example. For children of all ages, including your babies, do work in front of your child. When Brayden was a baby, we lived in a studio apartment, which meant I didn’t do cleaning while he was napping. I cleaned in front of him. He LOVED to help me clean. He sat on the bed and “helped” me fold laundry. He “helped” me push the vacuum around the house. He held a broom and pushed it around the floor. No matter the age of your children, they will benefit from seeing you clean. Explain: Explain what you are doing and why you are doing it. Keep it on your child’s level. This can even be applied to parenting choices. I often explain what I am doing with Brinley and why. My children are learning parenting practices from me. Start Simple: As your child gets older and able, have your child help where he can. Have him help clean up after independent playtime. Picking up toys is something children can do from a very young age. Keep it Small and Direct: Give your child manageable tasks. Give your child specific directions. To tell a child to go into a room and “clean it” is highly overwhelming. Instead, tell the child to pick up the books. Once those are all cleaned up, move on to another category. 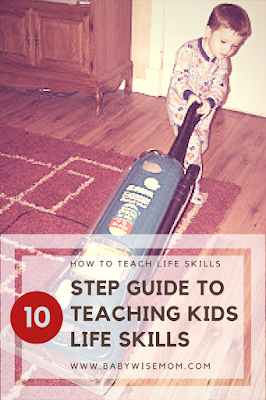 This makes the task manageable As adults, we make tasks manageable in our heads as we organize how to go about cleaning–children need help in doing this. Teach Your Child: Your child may have observed you sweep the floor or clean the bathroom, but that doesn’t mean she is an expert on it. Take the time to teach her how to do this. Demonstrate as you verbalize what you are doing. Have her practice and explain what she is doing. A tip I would give you is to have teaching sessions be one-on-one with your child. If I am teaching my child to cook, I find it easiest to do if I am one-on-one with that one child. We have times when we all cook at the same time together, but times I am teaching the skill, I keep it just me and the child. 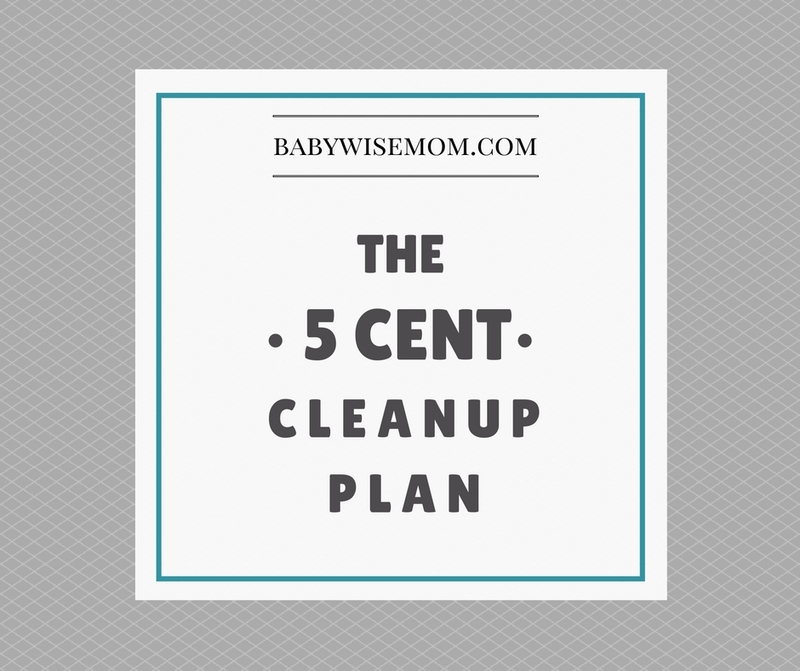 Allow Practice: Have your child practice cleaning. Balance praise for the effort done with pointing out where improvement can be made. Allow Mistakes: Your child will not do as good of a job as you do when cleaning or cooking. Your child’s bed will be lumpy after he makes it. Allow for these mistakes–let your child’s best effort be enough. It is very deflating to have someone come behind you and fix your best efforts. Have Patience: Have patience as your child learns and practices. With time, you will one day realize that your child is actually quite helpful. And that means your child will be able to do things for herself, her current family, and her future family. Be Consistent: Have a chore routine in your home. Set up situations that provide practice. Have family policies. When are chores to be done? What time of day? How many days a week? Make this work part of the routine. For maintaining consistency, chore charts are very helpful. See Chore Cards, Chore Jar, Morning Chore Cards, and Chore Wheel for ideas. Great post. I am just wondering if you can share what you expect your older 2 to do daily? I know you have the chore cards on the O-rings but i think most of these are more personal chores (getting dressed, teeth, hair, making bed). What in addition to that do you require daily? i know you mix up your chore systems so just wondering what you are doing now. I know from the grumbles and whines of my 4.5 and 6 YO that their nonpersonal chores have gotten more lax (my fault) and I need to require more not less (which i tell them!) And definitely with summertime approachiing and school being out there will be lots of time to fill and I will definitely be adding a lot of chores. I think there will be a difference in schoolyear vs holiday chores here.Anyways just wondering your thoughts. Very true on both fronts Allen! Yvonne,I think it is really a job in and of itself to keep chores going. Obviously as they become part of the routine it is easier to do, but each day is rarely the exact same so that chores can be the same time, same place each day.So I try to have something they do that is in conjunction with what I am doing that day. I have my chores broken down to make it a bit easier than trying to do it all in one day (like I was able to do when I had one child! That was amazing!). Anyway, I have always done this, and when Brayden went into full day school, it got hard to do it. I didn't want to wait until he was home to do my chores–I like to get my work out of the way first thing. But then I didn't have something for him to do.So I try to break it up. Like, Monday is laundry day. I leave socks for school kids to fold. It isn't a huge chore, but it is something and I don't mind (at all) leaving socks to be folded later. We do have the morning chore cards like you said, but those are all personal things like you said.I then have the chore wheel. Right now, our chore wheel says:-Help make dinner-Help with dishes-Set table-Clear table-Clean great room-Feed catsYou are on that chore for one week. So it takes us six weeks to get through it. I usually leave the chores for one rotation, so I only have to change them up four times a year. Did I answer your question? This is a great, and oh so helpful, post. Thanks! This is an ongoing topic/mission. We keep upgrading our kids' responsibilities as they get older, not that they love it, haha. Now they all participate in our deep cleaning. Yay!